No matter what your political views may be, there's no denying the fact that Hillary Clinton's candidacy for president of the United States will be remembered as one of the most important moments in women's history. And it's safe to say that she will be on everyone's minds on March 8, aka International Women's Day. If there's anyone who knows the monumental impact that wearing a certain colour can have, it's Clinton. It's not a coincidence that she chose to almost exclusively wear bright, solid colours while on the campaign trail and in her years in the public eye leading up to the election—including her time as first lady. 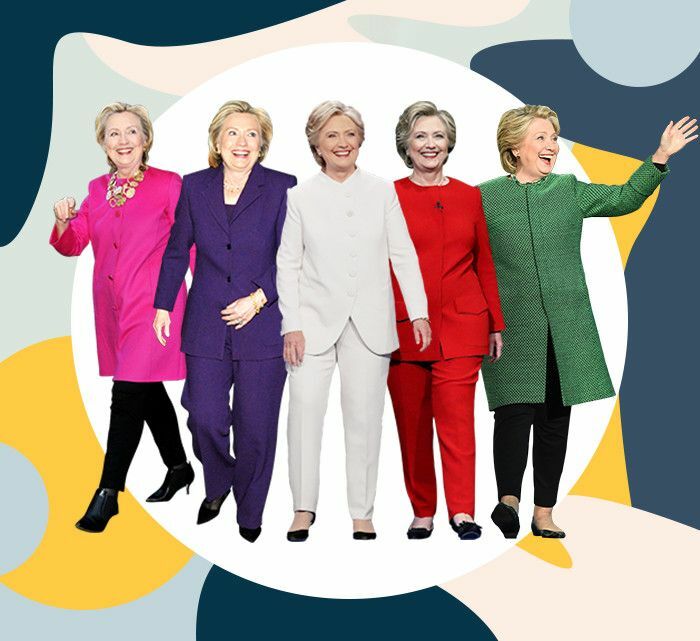 Read on to learn more about five Hillary Clinton–approved colours that will make the most impact on March 8, and shop some of our favourite options in each hue. Red is a colour that can't be ignored. It forces people to stop and pay attention. Clinton fittingly chose this strong, powerful hue for the first presidential debate in September. This dress is both powerful and sweet at once. According to the National Woman's Party, "Purple is the colour of loyalty, constancy to purpose, unswerving steadfastness to a cause." It's also the colour of dignity and self-respect, and it signifies bipartisanship. All of these are likely reasons Clinton chose to wear it for her concession speech and in repeat past occasions. Not only that, but it was one of the three colours adopted by the suffragettes. The perfect addition to a "chill" International Women's Day look. The symbolism of wearing all white also harks back to the suffragette movement, when women were strongly encouraged to wear white. According to a quote in The Guardian by Valerie Steele, the director of the Museum at FIT, "White has connotations in the west of purity and virtue, this idea of being the good guy." Added Steele, "Certainly the suffragettes were aware of that when they wore white—they were good people too; why shouldn't they have the right to vote?" Try pairing this chic blazer with white jeans and white ankle boots. Another signature colour of the suffragette movement was green, which Clinton has worn on multiple occasions. Green stands for hope, which is why Pantone chose it to be 2017's colour of the year. We'd definitely recycle this chic little dress for St. Patrick's Day. Remember those pink hats everyone wore to women's marches around the U.S. on January 21? The hue is unapologetically feminine and represents compassion and love. Clinton has chosen shocking pink on multiple occasions over the years, including for her most recent public appearance: a dedication ceremony for a series of stamps honoring Oscar de la Renta. Make a statement with both your sleeves and your top's colour. See our guide on what colours to wear together this spring.